Trump administration officials at EPA are phasing out the agency's enforcement focus on animal waste pollution and the oil and gas industry. Enforcement chief Susan Bodine said she wants to shift the focus away from oil and gas as a sector deserving of extra scrutiny and toward prioritizing broad environmental problems, such as air pollution. 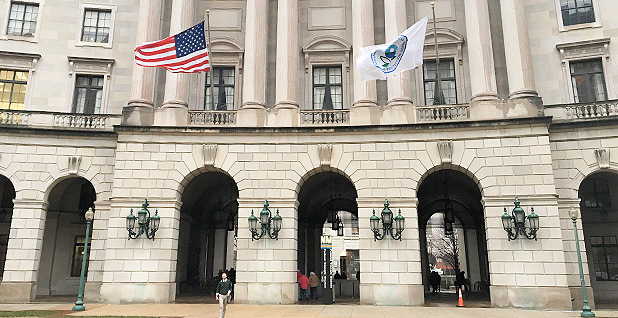 "This initiative historically focused on one industrial sector, implying that the EPA considers all problems in this sector — large or small — to be a priority," Bodine wrote in a letter this week to regional administrators. On animal agriculture, the reasoning is the same. An agency statement forwarded by a spokesperson said the agency wants to focus on pollution problems, rather than an industry. "Under this approach, an animal feeding operation that contributes to water quality impairment or an oil and gas facility that contributes to non-attainment with air quality standards or that creates exposures to air toxics would be a priority because of those impacts, not because of the industry sector," the agency email said. But the agency plans to continue initiatives on "industrial and chemical facilities," along with "hazardous waste facilities." Farmers and rural voters were a key constituency for Trump in his 2016 election bid. Oil companies have become key backers since he took office and began promoting an "energy dominance" agenda. Both groups complained bitterly about regulatory overreach by the Obama administration. Bodine, who is the assistant administrator for enforcement and compliance assurance, laid out the changes in a letter this week to regional administrators and agency enforcement officials formalizing changes to the agency's National Enforcement Initiatives. She is changing them to "National Compliance Initiatives." The new name, she said, will "better convey the message that increased compliance is the goal, and enforcement actions are not the only tool for achieving this goal." The idea, she wrote, was to focus on ensuring compliance with environmental laws, using a "full range of compliance assurance tools" rather than focusing on seeking out and penalizing violators. She had been discussing the idea with state officials and others since at least June (Energywire, June 11). She also wrote that her plan will provide increased opportunity for states and tribes to weigh in on the enforcement priorities. The changes have sparked fear among some inside the agency that the Republican administration wants to substantially weaken enforcement. Compliance can mean informal enforcement actions, compliance assistance websites, inspector training and better coordination among state agencies. Agencies can also work with trade associations, insurance companies and others to increase awareness of problems and create incentives for fixing problems. EPA uses its National Enforcement Initiatives to set priorities for the agency's enforcement work. Managers are expected to devote a certain portion of their money and resources to inspections of targeted industries. When enforcement staffers do inspections, they note on their report whether it is part of a national initiative. The move comes amid other efforts at the agency to present a friendlier face to industries, including oil and gas. For example, Bodine is expanding to the oil field a program that waives or reduces penalties for companies that self-report air emissions violations. But Bodine also said at an appearance in April that she was "shocked" that environmental violations "are happening as often as they do happen" (Greenwire, April 23). Bodine's letter said two enforcement initiatives, "Reducing Air Pollution from the Largest Sources" and "Keeping Raw Sewage and Contaminated Stormwater Out of Our Nation's Waters," will end after the coming fiscal year. She said they are each nearly complete. She also wrote that the agency is considering adding an initiative on drinking water starting in fiscal 2020. The animal farming initiative, formally called "Preventing Animal Waste from Contaminating Surface and Ground Water," is to be phased out in the coming fiscal year, which starts in October. But the oil and gas initiative would remain for the coming fiscal year, then likely get folded into air pollution efforts. When the agency develops its next three-year plan for initiatives, she wrote, the agency will look at merging the initiative with another one focused on reducing hazardous air pollutants. The agency could also look at focusing broadly on pollution from volatile organic compounds, toxic chemicals that emanate from oil and gas sites but also from many other industrial sites. Enforcement and compliance on other problems associated with oil and gas, such as water contamination, would be folded back into the agency's regular or "core" enforcement program. Shortly after Trump took office, state oil and gas associations complained to then-EPA Administrator Scott Pruitt that the Obama administration had been too aggressive on enforcement, particularly in the Rocky Mountain West. The enforcement campaign that sparked those complaints stemmed from the oil and gas enforcement initiative. EPA found that oil producers in North Dakota and Colorado were allowing storage tanks at their well sites to emit methane and volatile organic compounds. Those emissions can contain benzene and contribute to smog. Under Trump, the agency has expanded the self-reporting program, and inspections of "energy extraction" sites dropped by one-third in the Trump administration's first fiscal year.